DVDFab Mac Blu-ray Player, with its robust DVD and Blu-ray playback functionalities, is definitely your right choice if you’re looking for an ultimate DVD player software for Mac. It can freely and smoothly play any newly released DVDs or your old DVD collection, with fantastic effect and complete DVD control feature. Next is a simple tutorial about how to use it to play DVD on your Mac, please follow me to have a look at this professional Mac DVD player software. DVD playback is one of DVDFab Mac Blu-ray Player’s multiple functions, just download and install this program, and as soon as installation has completed, you’ll see a corresponding shortcut on the screen of your Mac. Just double click it to launch it. After the program is opened, you’ll see an “Open File” icon on the main interface. However this option is used to import in iso files, movie folders, and other video file. In this tutorial, we are not going to use it, we simply insert the DVD disc you want to view into the DVD optical drive, then the player will load it. 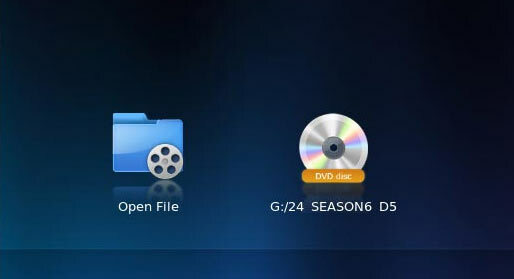 When everything is finished, you’ll see this DVD’s icon sitting at the right of “Open File”. Now click on this movie icon then you navigate this DVD to play it. Note that you can easily control the play and set up something any time when enjoying the movie. For example, some basic control like pause, stop, play, volume up, volume down, fast forward, fast backward can all be achieved on a control bar which is brought about by hovering mouse on the bottom of the screen. And the full screen setting option is right on another control bar which pops up when hovering mouse on the top. If you right click on the screen, a settings panel will appear, where you can control the play, set audio and subtitles, open another movie file or disc, etc.